It was a good night for Democratic incumbents in the legislature and the Democratic establishment throughout the state as favored candidates from top to bottom did well in Tuesday’s primary. There were only nine incumbents who lost, while newcomers backed by incumbents won. The Republican establishment did not fare quite as well. It was a bad night for two senior Republicans in the state Senate. Minority Leader David Brinkley lost to Del. Michael Hough, who portrayed Brinkley as too liberal for Frederick County, and Sen. Richard Colburn lost to Del. Addie Eckardt, a former ally and ticket mate on the Middle Shore. Colburn was rebounding from a messy and well publicized divorce resulting from an affair with a former aide. Of 16 incumbent senators challenged within their own party, they were the only two that lost. With other delegates and senators retiring or running for higher office, there will now be at least 47 new members among the 141 in the House of Delegates, and at least 10 new senators. At the top of the Republican ticket, real estate executive Larry Hogan, a former Ehrlich administration patronage chief, beat Harford County Executive David Craig, favored by many in the Republican establishment. In the nasty Republican race for Anne Arundel County Executive, appointed incumbent Laura Neuman lost to Del. Steve Schuh. The delegate made strong appeals as the “real” Republican with the backing of a long list of establishment party members including former Gov. Bob Ehrlich. He also raised over $1 million for the race. But in Montgomery County, incumbent Democratic County Executive Ike Leggett, a former chair of the state party, easily won reelection with 46% against former County Executive Doug Duncan and County Council member Phil Andrews. Four veteran Republican delegates lost their seats, not completely unexpectedly. Del. Donald “Doc” Elliott, 82, of Carroll County lost his bid for an eighth term to a county commissioner. Del. Don Dwyer of Pasadena ran sixth in his two-member district — not a surprise after his double conviction for drunken driving and drunken boating and weekends spent in jail. Del. Michael Smigiel of Cecil County, one of the loudest GOP voices in the House and chair of the Tea Party Caucus, appears to have lost a close race in four-county District 36 on the Upper Shore, Del. Joe Boteler of Baltimore County, redistricted out of District 8 into 42, lost to a lawyer Christopher West, former executive director of the state GOP. Among Democrats, five incumbent delegates lost, but at least two had to lose after redistricting put three Democratic delegates into a single-member District 44A. Del. Keith Haynes won the seat, and Dels. Keiffer Mitchell Jr. and Melvin Stukes lost. Del. Shawn Tarrant also lost his District 40 seat to a newcomer, as did Michael Summers in 47A and appointed Del. Darren Swain in District 24. 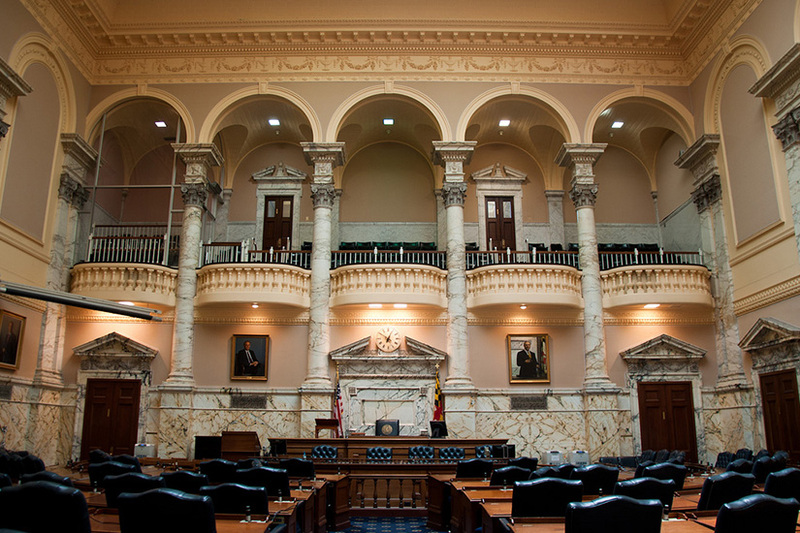 It was a mixed night for former delegates seeking to go back to Annapolis. Former House Minority Whip Bob Flanagan gets a chance to reclaim a seat, beating Ellicott City businesswoman Carol Loveless. Former delegate Michael Gisriel, who lent himself $85,000, got absolutely creamed in District 12 with three open seats. He ran eighth among 10 candidates, damaged by two union mailers that played up his disbarment and his lobbying for gambling interests. Former Del. Richard Sossi lost out in a grudge match to Sen. Steve Hershey, who beat him four years ago, but former Del. Cheryl Kagan won the Senate seat being left by Sen. Jennie Forehand, who beat Kagan last time. Here’s a full rundown of some of the races by county and district. A complete list of districts and primary election results can be found on State Board of Elections website. MarylandReporter.com also has a full list of candidates, campaign finance and endorsements. Unless already noted, all other incumbent senators and delegates won their primary for reelection. Many will face only token opposition in November in districts drawn to heavily favor Democrats or Republicans. Sen. David Brinkley, minority leader of the Senate, lost to Del. Michael Hough. Brinkley, 54, has served in the Senate since 2003, and as minority leader first in 2007-2008 and then again from 2013 onward. He has cultivated a reputation for working across the aisle, despite a voting record that leans heavily to the right. Hough, who is 20 years younger than Brinkley, ran a fierce campaign against Brinkley, accusing him of voting with O’Malley and painting him as a traitor to GOP values. The incumbent Afzali won, along with Vogt. The remaining Republican candidates, Del. Kelly Schulz and Wendi Peters, sided with Brinkley, but only Schulz won. The delegates who advanced will face off against Democrat Gene Stanton in the General Election, though it likely be challenging for Stanton, a Montgomery County public school teacher, to win a seat in the staunchly conservative District 4. It includes Frederick county and a sliver of Carroll county. Hough will face Democrat Dan Rupli in the general election. Carroll County Commissioner Haven Shoemaker will join Del. Justin Ready and Del. Susan Krebs in the legislature, as Del. Donald Elliott lost his bid for an eighth term. All three candidates won the primary by a significant margin. Joshua Stonko, 21, who ran an energetic grassroots campaign, fell behind Shoemaker, with Mayor of Westminster Kevin Utz coming in fourth. The District 5 senator, incumbent Republican Sen. Joseph Getty, will duke it out with Democrat Anita Riley, a member of the Carroll County Democratic Central Committee, come November. In a presumed victory, Del. John Olszewski Jr — “Johnny O Jr.” — overtook his opponent, Russ Mirabile for the seat left by retiring Sen. Norman Stone, the legislature’s longest serving member retiring after 52 years of service. Olszewski Jr., son of Baltimore County councilman John Olszewski, will go up against two opponents in the November General Election. The crowded race for the House of Delegates — featuring nine Republicans and 11 Democrats — narrowed considerably. Only one of three of Olszewski Jr.’s slate, incumbent Del. Mike Weir, won the Democratic primary alongside former Baltimore City councilman Nicholas D’Adamo Jr. and Jake Mohorovic, former member of the House of Delegates. Ric Metzgar, Bob Long, and by a slight margin, Robin Grammer Jr., won on the Republican side. Shelly Hettleman won the House of Delegates seat vacated by the losing Attorney General candidate Jon Cardin. Hettleman was widely expected to be the victor. A former staffer of U.S. Sen. Ben Cardin, Hettleman won Cardin’s endorsement and began campaigning early, pumping funds into her campaign account. Hettleman got more votes than incumbent Dels. Dan Morhaim and Dana Stein, who were also voted back. The trio faces only one Republican in the General Election, Laura Harkins. The senator from The Baltimore County District 11, Robert Zirkin, is running unopposed in both the primary and general elections. In a County Council race, incumbent Democrat Vicki Almond walloped Jon Herbst, who was backed by County Executive Kevin Kamenetz. The only other primary race was the Republican candidates for the House of Delegates in 42B. Incumbent Del. Sue Aumann won her seat, but Del. Joseph Boteler III was left behind, with lawyer Chris West, former counsel of the State Republican Party winning the second seat. Two Democratic candidates, Robert Leonard and Craig Little, will go up against them in the General Election. In a close race in District 9, Ryan Frederic narrowly beat Dan Medinger for the Democratic Senate nomination with 52% of the vote, and will face Republican Del. Gail Bates in this northern Howard district that votes Republican. In two-member 9A, Republican Del. Warren Miller easily won renomination, but his running mate, Frank Mirabile, did not, narrowly losing to Trent Kittleman, stepmother of Sen. Allan Kittleman. In single-member District 9B, as mentioned above, former Del. Bob Flanagan, former transportation secretary under Ehrlich, beat security business owner Carol Loveless in the Republican primary with 56% of the vote. Lawyer Tom Coale easily won the Democratic Primary with 62% of the vote over former teacher Rich Corkran. District 12 is the only one in the state that has three open delegate seats, which attracted 10 Democrats to the race. They were won by two physicians and a teacher, possibly tripling the number of doctors in the House. Drs. Terri Hill and Clarence Lam won as did math teacher Eric Ebersole. The three shared endorsements from a number of unions, environmental and progressive groups — more endorsements and more funding than most of their opponents. Former Del. Michael Gisriel was possibly the best funded candidate in the race, with extensive ad buys emphasizing his Annapolis experience. But the SEIU union, who had endorsed the three winners, sent out mailers saying Gisriel “can’t be trusted,” pointing to his disbarment and lobbying. The incumbent slate in District 13 won with the addition of Vanessa Atterbeary, after a husband-wife team pulled a switch. Team 13 — Del. Guy Guzzone for Senate, Dels. Shane Pendergrass and Frank Turner, both committee vice chairs, had added school board member Janet Siddiqui to their slate last year. But come the February filing deadline and husband Nayab Siddiqui filed for the seat, and Janet dropped out. Team 13 dropped Siddiqui, fuming at the switch and supported by County Executive Ken Ulman. Nayab Siddiqui was endorsed by Gov. Martin O’Malley and U.S. Rep. Elijah Cummings, but he came in a distant fourth. Neither former County Executive Doug Duncan or County Councilman Phil Andrews could overpower incumbent Montgomery County Executive Isiah (Ike) Leggett in the Democratic primary. Leggett took 45% of the vote, while Duncan received 32% and Andrews 22%. Leggett will face Republican candidate Jim Shalleck in the November general election. Since Democrats outnumber Republicans by nearly 3-to-1 in Montgomery, a third term for Leggett appears to be a shoe-in. Del. Susan Lee sailed to victory in the Dist. 16 state Senate Democratic primary, taking 85% of the vote. The district primarily covers areas in Chevy Chase and Bethesda. Lee will succeed Sen. Brian Frosh who vacated his seat to run for attorney general. Lee picked up endorsements from all the major unions and progressive groups that Montgomery County politicians vie for. The Washington Post and the Gazette also endorsed Lee, who would become the first Asian-American state senator in Maryland. In November, Lee will face Republican Meyer Marks of Bethesda, an at-large member of the Republican Central Committee who is running on a platform of cutting corporate income tax and fiscal responsibility. Former delegate Cheryl Kagan overcame a contentious challenge from Del. Luiz Simmons in the race to succeed Jennie Forehand, a state senator who has represented Rockville and Gaithersburg since 1994. Forehand is retiring. Kagan won 54% to 45%. The race became known as the most combative and mud-slinging race in all of the Montgomery County races. Several major organizations known to endorse sat the race out, including the Montgomery County Education Association, the AFL-CIO, the League of Conservation Voters, the Sierra Club and the Greater Capital Area Association of Realtors. Kagan ran unsuccessfully against Forehand in 2009, but received Forehand’s endorsement for this race. She will face off against Republican Steve Zellers who is expected to run on an anti-Obamacare and fiscal restraint message. Voters in Legislative District 18 re-elected Sen. Richard Madaleno to a third term, delivering a third, consecutive defeat to challenger Dana Beyer, who ran unsuccessfully for the House of Delegates in 2006 and 2010. The contentious race received attention from the national media. If victorious, Beyer would have become the first transgender elected to state office in Maryland, unseating the first openly gay state Senator. Madaleno, a member of the Senate Budget and Taxation Committee since 2007, received the lion’s share of coveted endorsements from unions, environmental groups and progressive causes such as Casa in Action, Equality Maryland and the Montgomery County chapter of the National Organization for Women. The Washington Post and the Gazette also endorsed the incumbent. Beyer was a senior legislative advisor to County Councilwoman Duchy Trachtenberg from 2007 to 2010 and is a retired eye surgeon. Currently Beyer is executive director of Gender Rights Maryland. Madaleno will go unchallenged in the November general election. Republicans did not run a candidate in the district. District 18 covers Chevy Chase, Kensington, Wheaton and Silver Spring. After eight years of no open seats, District 20 had two this election season. Eight Democrats came forward to claim seats vacated by Del. Heather Mizeur, who ran for governor, and Del. Tom Hucker, who ran for county council and won with 40% of the vote. A slate that formed as late as early June, which includes Sen. Jamie Raskin, Del. Sheila Hixson, David Moon and former U.S. Department of Homeland Security official Will Smith, will advance to the November general election with nominal opposition. Moon is a political consultant and founder and editor of Maryland Juice, a left-leaning political blog. The slate received endorsements from the Montgomery County Education Association, Equality Maryland and the Career Fire Fighters. A slew of other candidates running in Dist. 20 received noteworthy endorsements. Darian Unger was endorsed by the Washington Post, the Gazette, the Sierra Club and the League of Conservation Voters; Will Jawando received endorsements from MCGEO, SEIU, AFL-CIO, Casa in Action and the Washington Post. In two-member District 30 A, Democratic House Speaker Mike Busch will be running with former Anne Arundel County Council member Chuck Ferrar in the fall against Republican Del. Herb McMillan and Genevieve Lindner. In two-member District 31B, where Del. Don Dwyer lost in a field of eight, the Republican nominations were won by House Minority Leader Nic Kipke and Meagan Simonaire, whose father Bryan Simonaire is the senator from the district. In District 32, Democrat Mark Chang was nominated to the seat being vacated by Del. Mary Ann Love. In District 33, Del. Tony McConkey has held on to his seat, as has Del. Cathy Vitale, with Sid Saab added to the Republican ticket. Incumbent Marvin Holmes had secured one of the Democratic primary nominations in District late Tuesday night. Del. Joe Vallario, whom many had speculated could be ousted by redistricting, appeared to have hung on to his seat, trailing Holmes by 5%, and ahead of the next candidate, Ron Watson, by another 5%. Vallario has been a member of the House of Delegates since 1975 and is chair of the powerful Judiciary Committee. He has received repeated criticism that he is too quick to consign bills he does not like to his desk drawer. There were rumors that the redistricting was designed by House leaders to oust Vallario by expanding his district to include Bowie, a section of Prince George’s he had never campaigned in, but if so, the ploy appears to have failed. Mike Hethmon is the only Republican challenger to Holmes and Vallario. Despite the shadow cast by a federal extortion and bribery trial, incumbent Ulysses S. Currie survived a rare primary challenge to take the democratic Senate nomination in District 25 with 58% of the vote. Currie, who has spent almost 38 years in the House and Senate combined, was challenged by Del. Melony Griffith, who has served for 16 years in the House of Delegates. Some had thought that Currie would be uniquely vulnerable to a challenge this year, as he faced federal extortion and bribery charges this past term. Though Currie was ultimately acquitted, he was officially censured by the Senate. The charges dealt with Currie’s failure to disclose payments of roughly a quarter of a million dollars to work with the retail chain Shoppers Food Warehouse. Currie will now face Republican Kory Boone in the general election. Incumbent Dereck Davis, and newcomers Angela Angel and Darryl Barnes beat out a crowded field of 10 candidates to win the three Democratic primary nominations for the House of Delegates in District 25. The vacancies came about when Del. Aisha Braveboy ran for attorney general and Del. Melony Griffith ran against Currie. Davis has been a member of the House of Delegates since 1995, and chairs the House Economic Matters Committee. Angel was an attorney who specialized in prosecuting child abuse and neglect. She later served as Davis’ policy advisor for education, social services and philanthropy. Barnes is a businessman and the founder of the nonprofit organization Men Aiming Higher, which aims to mobilize at-risk young men through tutoring and mentoring programs. They are running unopposed in the general election, so will automatically gain their seats. After taking 50% of the vote, incumbent Anthony C. Muse has taken the Democratic Party’s primary Senate nomination in District 26 after being challenged by veteran Del. Veronica Turner, and newcomer Brian Woolfolk. Turner, who has served in the House of Delegates for 11 years, fell 17% and 2,000 votes shy of Muse. Woolfolk, who has extensive experience as a staffer on the Hill, only got 8.5% support, just over one percentage point above Jerry Mathis, who filed to run, but did not launch a campaign. Muse has served in the Senate since 2007, and in the House from 1995-99. He will face Republican Kelley Howels in the general election. In House District 26: Incumbents Jay Walker and Kris Valderrama easily secured two of the three available seats in the House of Delegates. Tony Knotts, who served on the Prince George’s County Council from 2002 to 2010, took the third seat, which was vacated by Veronica Turner so she could run for Senate. Senate veteran Roy Dyson ran unopposed in the District 29 primary, and he will face Republican opponent Steve Waugh in the general election, who beat two St. Mary’s County Commissioners, Larry Jarboe and Cindy Jones. Stephen Hershey has once again bested opponent Richard Sossi, this time to take the Republican nomination for state Senate. Hershey and Sossi last ran against each other in 2010, when they were competing for a House of Delegates seat which Hershey won. Hershey’s campaign garnered national media attention when the Hershey Chocolate company filed a federal lawsuit against Hershey, saying his signs – which appear almost identical to that of the logo on a Hershey’s chocolate bar – violated trademark law. The chocolate company is demanding Hershey pay legal fees and recall all campaign material. Hershey will run against democrat Ben Tilghman in the general election, and will presumably be using different signs. In addition to the allegations he was facing from staffers, Colburn also went through a messy divorce during his last term in the Senate, with his wife citing an affair the Senator had with a former aide as the cause. Though his wife, Alma, later endorsed Colburn, this was not enough to save his campaign. Eckardt will face Democrat Christopher Robinson – who lost to Colburn in the last election cycle – in the general election. Gaining 61% of the vote, Del. Mary Dulany James emerged the victor of a competitive race against Art Helton for the Harford County seat formerly held by retiring Republican Sen. Nancy Jacobs. James, daughter of former Senate president William S. James, will go toe-to-toe with Republican candidate Bob Cassilly in November. Republican Del. Wayne Norman won the primary for the District 35 senate seat in Harford County, beating Thomas Wilson. The incumbent, Sen. Barry Glassman, stepped down to run for county executive. Norman will battle against Democrat Bridget Kelly in the general election. Majority Whip Lisa Gladden won over Will Hanna for the Baltimore City seat. Gladden won handily against Hanna, a veteran and community leader in Park Heights. With no general election opponent, Gladden will officially serve as the senator. Sen. Jim Brochin , who has never lost an election, continued his win streak, getting 70% of the vote against challenger Connie DeJuliis, a former member of the House of Delegates. Brochin said this was his first primary. “To have Democrats come out and support a moderate Democrat, and support an independent is a pretty big deal, I’m very humbled and really happy,” Brochin said. DeJuliis faltered midway through her campaign after Brochin’s campaign staff stumbled upon her husband, Commissioner of Labor and Industry J. Ron DeJuliis, along with two others, uprooting Brochin campaign signs and replacing them with Connie DeJuliis’. Later it was found that Brochin did not have permission to erect his signs. Ron DeJuliis, a top member of the O’Malley administration, faces a misdemeanor theft charge from the incident, which garnered attention from beyond Baltimore County borders. O’Malley previously endorsed Connie DeJuliis in the race. Brochin faces Republican Tim Robinson in November. Incumbent Democratic Sen. Joan Carter Conway won the primary with 65% of the vote over Bill Henry, a Baltimore City councilman. With no opponent in the general election, Carter Conway has reclaimed her seat. Due to redistricting, two of three Baltimore City Democratic delegates were forced into a single-member district, with only one emerging victorious: Del. Keith Haynes. Del. Keiffer Mitchell lost, alongside Del. Melvin Stukes. Haynes has served in the House since 2003 and Deputy Majority Whip since 2006. Mitchell, a newbie to the legislature after serving on the City Council, was known for his part in pushing through marijuana decriminalization this session. Stukes was elected in 2007, having been on the Baltimore City Council for 13 years. Despite a knock-down, drag-out fight from former political consultant Julius Henson, he failed to win the Baltimore City seat from incumbent Democratic Sen. Nathaniel J. McFadden. McFadden, President Pro Tem and long-time senate member, won with more than 80% of the votes. Henson had initially been barred from running after a judge said his campaign violated his parole — he was sentenced to 60 days in prison amid charges of campaign corruption. Henson was later cleared to run. Len Lazarick, Jeremy Bauer-Wolf, Glynis Kazanjian and Margaret Sessa-Hawkins contributed to this story.